A tale by Grimm Brothers' about a Cat, Dog, Donkey, and Rooster who escape the farm life and their mean master and resolve to become musicians. But on their way to become musicians they meet a gang of robbers. 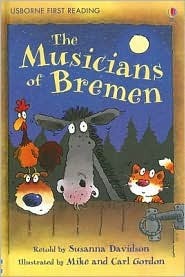 I had heard this story countless times in my childhood but I never knew it was called The Musicians of Bremen. I loved the illustrations. The Picture Book Challenge 2011 is hosted by There's a Book. If you want to sign up for the challenge, click here. I really want to do this picture book challenge. I LOVE Children's Books. I gotta figure out how to do it. The Picture Book Challenge 2011 is hosted by 'There's a Book'. If you want to sign up for the challenge follow this link.